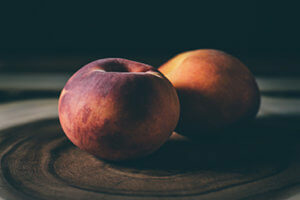 The Georgia peach is well-known, but the sweet Florida peach is stealing the spotlight. Peaches have become an increasingly popular alternative crop for citrus growers that have been plagued by citrus greening. While labor intensive, Florida peaches have a unique advantage over other popular peach states. The peaches in Florida are typically a “low-chill” variety, these are peaches that require less cool weather than other state’s varieties, which make them suitable for Florida’s mild winters and warmer climate. Florida’s warm weather gives Florida peaches an advantage. The crop is available just after South American varieties and just before those from Georgia, South Carolina, California and Texas. Florida-grown peaches are in season from mid-March until mid-May. According to the Florida Department of Agriculture and Consumer Services, about 1,000 acres of peaches are grown in Florida. Peaches are a great source of Vitamin C and Potassium, can help prevent stress and anxiety and can help lower cholesterol.